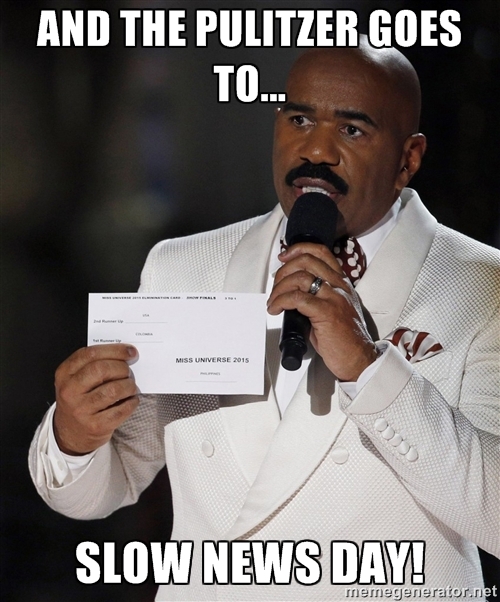 This is not only slow news, but old news. Steve Harvey announced the wrong winner of the 2015 Miss Universe pageant and then had to correct himself. Behold. Needless to say, this made global news. Wouldn’t any host or entertainer’s natural inclination be to comfort the person they just embarrassed on international television? And isn’t Donald Trump somehow involved in these shenanigans? And doesn’t everyone seem to be awfully calm and understanding about the whole thing? I call baloney. Thoughts please and thank you.